Sweet Chilli Sauce is a staple in many Australian homes. I’ve always really enjoyed it too, whether it’s just to jazz up some plain steamed veggies; stirred through some cashew cream cheese to make a ‘sweet chilli philli’ style dip; in a simple stir fry (easiest ever = tamari + sweet chilli sauce + water); or to make a vietnamese-style dressing or dipping sauce. 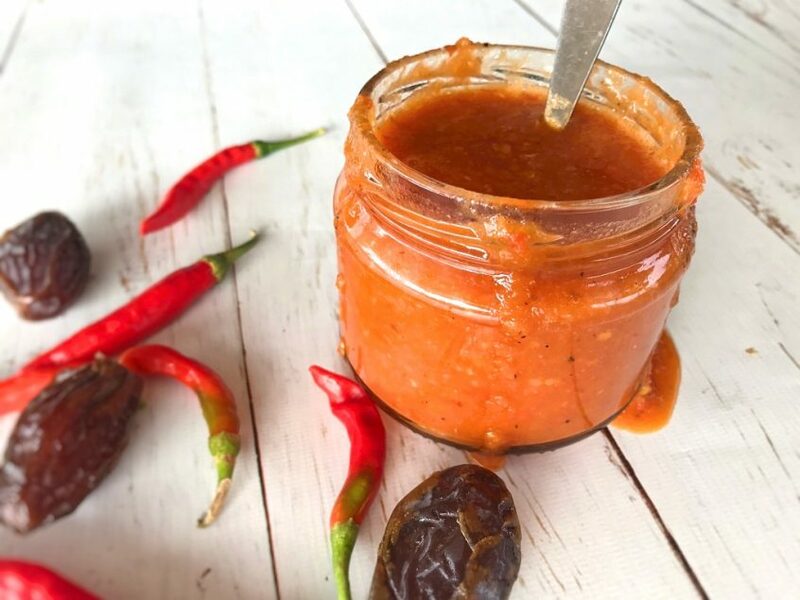 Sweet chilli sauce is a fab condiment to have on hand. However, did you know that the first ingredient listed (ie. the most abundant ingredient) on just about EVERY sweet chilli sauce in the supermarket is SUGAR. With sugar content upwards of 60g/100g! 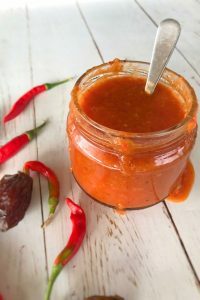 This made me angry… so I decided to try and make my own sweet chilli sauce using the natural sweetness of real foods like red capsicum, tomatoes and medjool dates. Using foods like this means we don’t only get a naturally sweet sauce but also a crap tonne more vitamins, minerals, phytonutrients, fibre and polyphenols than you would in a store-bought sauce. 2 birds eye chillies, deseeded. Place all ingredients into a blender and blend until smooth-ish (you judge the consistency you like). Taste and adjust for flavours. Remove from heat, transfer to glass jars and store in the fridge for 3-4 weeks.